Two of the lipsticks I've been wearing this Spring come from the Covergirl Lip Perfection line. CoverGirl Lip Perfection in Flame is a beautiful red shade that is sure to stand out in a crowd. I love wearing it as an alternative to a bold red lip. This color is more fun and flirty than most reds, in my opinion. 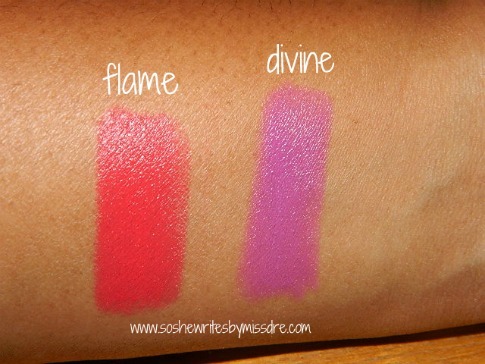 CoverGirl Lip Pefection in Divine is a beautiful violet shade that is very comparable to MAC's Up The Amp. 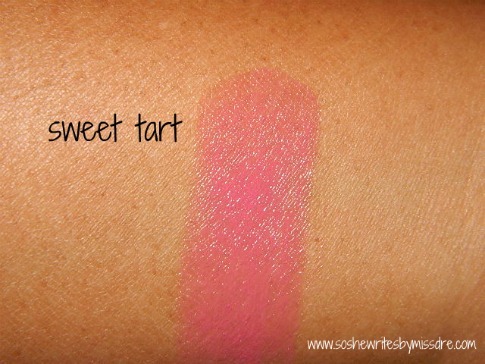 It has a very creamy finish and has become one of my all-time lipstick favorites. I don't think I've seen a shade quite like this with any other drugstore brands. 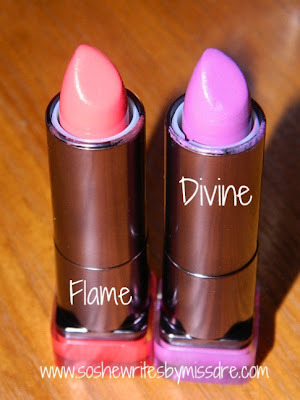 Both lipsticks have great color payoff and are very moisturizing. They can be found at CVS and other locations, retailing at $7.99. Below are swatches. 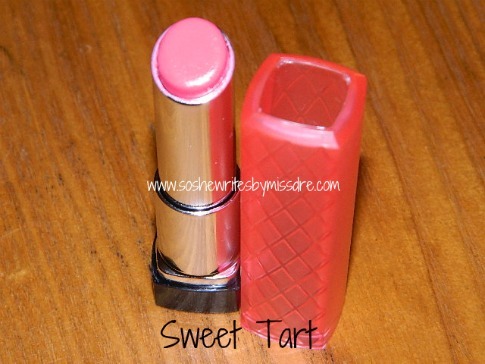 Another drugstore favorite of mine this season is Revlon Lip Butter in Sweet Tart. This lippie is very moisturizing, as are all of the Revlon Lip Butters I have tried. It gives a sheer color payoff and works well for an everyday look. 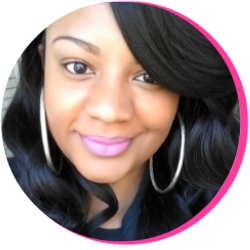 This lippie can be found at CVS and other stores, retailing at $7.49. Check out the swatch below. 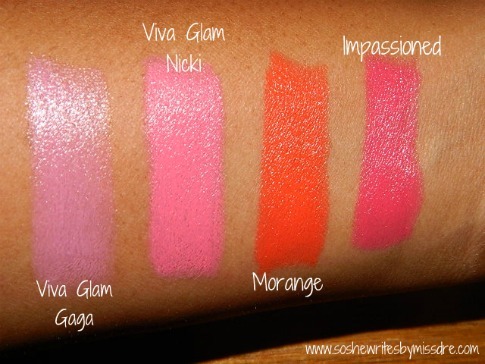 The rest of my Springtime favorites are MAC Viva Glam Gaga, Viva Glam Nicki, Morange, and Impassioned. Viva Glam Gaga is a bubble-gum pink color with a Lustre finish. The color payoff is buildable and can be worn by anyone of any shade, if paired with the right lipliner. Viva Glam Nicki is described on MAC's website as a bright yellow pink and has a Satin finish. 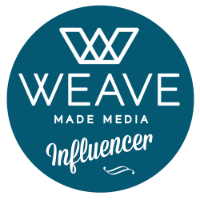 This color is one that may take some tweaking to achieve a desired look. Matched with the perfect lipliner, however, many can pull off wearing this neon color. Morange is described on the website as a "loudmouth orange" and is considered that for good reason. This is a very bold, vibrant shade, and its Amplified finish makes it that much more vivid. This shade is from the permanent line and is also featured in the new MAC Fashion Sets Collection Asia Pacific, Europe and Africa, and Latin America and Middle East. Impassioned may be my favorite shade in the entire bunch. This may be because Impassioned is an amped-up Fuchsia and Fuchsia is my favorite color. It has an Amplified Finish and looks great on any skin tone. 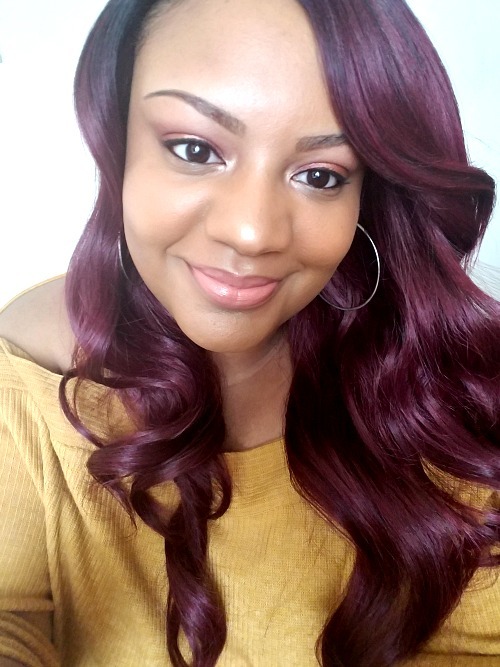 This lipstick is from the permanent line and is also featured in the new MAC Fashion Sets Collection Asia Pacific, Europe and Africa, and Latin America and Middle East. 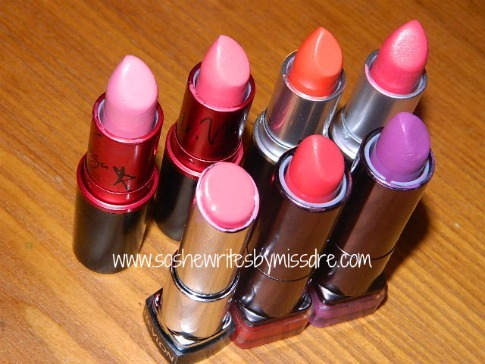 Be on the lookout for makeup looks featuring these lippies coming soon! Do you wear any of these shades? If so, how do you feel about them? What lipstick shades are you wearing this season? Please share in the comments!